NUTS make for a healthy and nutritious snack. They’re full of vitamins and proteins, while also being a good source of fibre. Nut aficionados know that there’s a huge variety of nuts in the market. We’ve created a list to narrow down some of the healthy nuts that you should include in your diet. We’ve also added some tips. They are among the healthiest nuts as they have a lower amount of calories. They also contain protein and healthy fats that actually help with weight loss. Almonds absorb the smell of anything it’s stored with. So make sure to keep it far away from strong smelling food like durians. Make sure to store them in an air-tight container, away from direct sunlight and moisture or they’ll go bad. If you’re picking out almonds to use in cooking, make sure to pick the raw, unflavoured almonds. Flavoured, cooked almonds may alter the taste of your recipe. If you’ve roasted the almonds, make sure to store them in air-tight containers, to prevent air from getting to them. Toasting almonds helps it to release its oil, so using oil isn’t really necessary. If you’re planning to use them in baking, it’s best to avoid toasting the almonds with oil as it can become too oily. In Malaysia, it’s not uncommon to see street vendors selling roasted chestnuts. They make for a great snack. Did you know that chestnuts are actually much easier to peel when they’ve been cooked? When picking out chestnuts, always make sure to pick out the ones that look smooth, feel heavy. Avoid any that have visible blemishes or damage to its shell or makes noises when shaken. 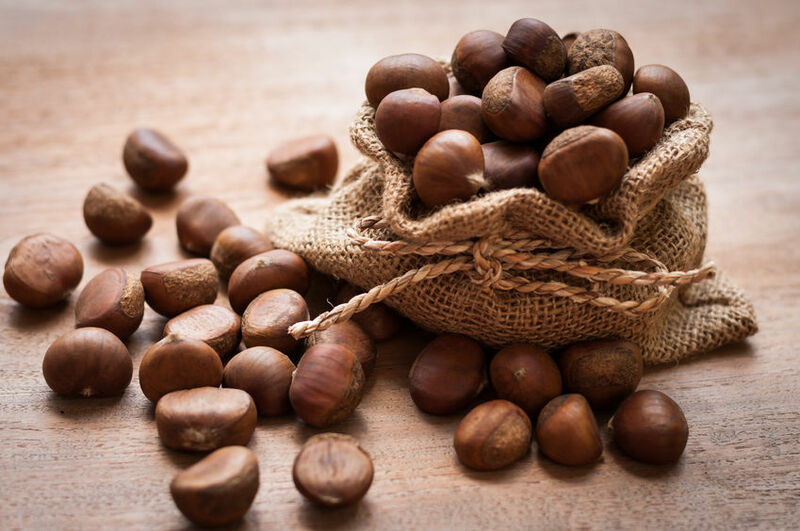 Chestnuts can easily dry up, so make sure to store them in a cool, dry place. Make sure to use them soon after purchase. Once cooked, refrigerate chestnuts if you’re not eating them. Before cooking chestnuts, make sure to cut an ‘X’ on the top of the chestnuts. This prevents them from ‘exploding’ during the cooking process. Candlenuts are often used in Malaysian cooking. They’re often used as a thickener in curries. Because of their high oil content, it’s wise to use them up soon after purchase or store them away in the refrigerator or freezer. It’s not advised to eat candlenuts raw as they contain phorbol and saponin, which are mildly toxic. Cooking the nuts causes it to lose its toxicity. It’s best to cook candlenuts in their shells. It’s easier to remove the kernels after they’re cooked. Lotus seeds, or as they’re also known as lotus nuts, are a common feature in Chinese cooking. They are green coloured when fresh and turn cream to yellow colour when dried. They can be eaten when they’re raw, cooked, or dried. Fresh lotus seeds should be refrigerated when not used to maintain its freshness. However, it’s best to use them while they’re still fresh.